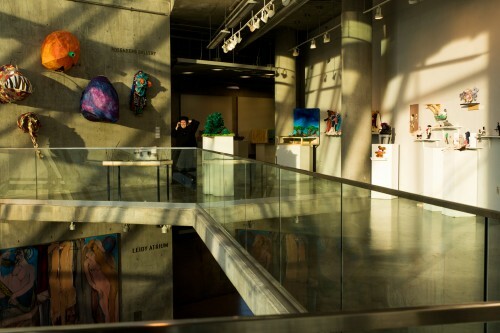 Rosenberg Gallery (approximately 577 square feet / 57 linear feet), on the 2nd floor of Brown Center overlooking Leidy Atrium, was named in recognition of The Henry and Ruth Blaustein Rosenberg Foundation's generous support of the College. Rosenberg Gallery adds a significant venue for expanding MICA's exhibition program. Rosenberg Gallery is home to numerous exhibitions each year by nationally and internationally renowned artists. It is one of a number of campus-wide sites for the Commencement Exhibition. And throughout the year it provides a venue for solo exhibitions by students selected through the juried Student Space Gallery program.